The earliest human use of this rugged mountainous region dates back to the Stone Age. 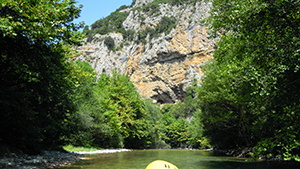 Several caves along the Voidomatis watershed (e.g. Klithi, Boila, Megalakkos) indicate the occupation of the area by mobile hunter-gatherers at the end of the ice age (17,500 to 9,500 years ago), when the climate took its last gradual upturn. These caves, which offered shelter and protection, were used during the warmer months of the year as the hunter-gatherers exploited the prolific resources of the area. Flint (chert) pebbles could be used to make weapons and tools. Wood could be gathered to maintain hearths for light and warmth. And there were abundant populations of ibex and chamois, stocky red deer, beaver, rodents, reptiles and fish to subsist on. In historic times (9th-4th c. B.C.) the Zagori region, with its extensive grasslands and forests, hosted a flourishing agropastoral community, as revealed by the architectural investigations at the mountain pass between the modern villages of Vitsa and Monodendri. This upland terrain was an integral part of the kingdom of the Mollosians, the most powerful ancient tribe of inland Epirus. In hellenistic times (3rd-2nd c. B.C.) a system of stone-built enclosure walls was established on various hilltops, providing a unified defensive line for the population. In antiquity, there were two acme periods of the Zagori region with its extensive grasslands and forests. Between the 9th and 4th c. B.C. small agropastoral communities flourished at the heart of the limestone massive, while in the ensuing 3rd and 2nd c. B.C. a system of masonry enclosures (acropoleis) on various hilltops provided a unified defensive line to the Mollosians, the most powerful inland tribal kingdom, and the Epirotic political alliances. For most of its history under Ottoman rule (mid. 15th to early 20th c.), Zagori, i.e. the “place behind the mountain”, maintained a semi-autonomous administrative status and enjoyed tax exemptions. As a result, there developed a network of flourishing settlementsand ground works (e.g. stone bridges, water mills). A rich mercantile emigrant class, with businesses flourishing in all the main European trade centers (e.g. Venice, Trieste, Vienna) directed a stream of economic and cultural capital homewards. 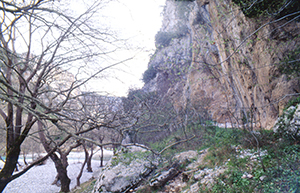 By the 19th century, Zagori was an important educational center, including schools and libraries promoting the spirit and the ideas of the Enlightenment. At the same time, the local economy benefited greatly from the Sarakatsani shepherd class, who brought sheep and goats to Zagori and finally took up permanent residence in the area after the middle of the 20th century.